overcoming the alienating effects of a for-profit social system long past its use-by date. A new model of social organisation is growing within the old system of capitalist property relations and employment contracts. It is far from being an independently breathing organism as yet but with the help of a suitably skilled collective midwife, it has a great chance of life. Sayers' excellent work of restoration can open the minds of a new generation. Hopefully it will help to reward them with more success than was achieved by the post-1968 generation of young radicals who cut their philosophical teeth on an earlier work on the subject by Istvan Meszaros. It will just as valuably refresh the minds of those who believe themselves to be familiar with the history of philosophers' evolving theories of the concept. The new work, which brings together a series of essays written over several years, is a sure-footed, easily accessible guide to a journey through material which, though more than one and a half centuries old, has never been more timely. 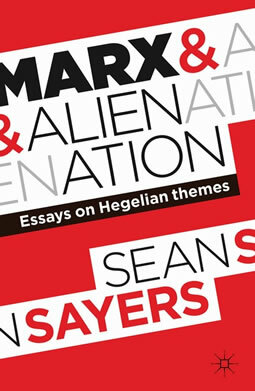 Sayers takes us through Marx's adoption and development of Hegel's dialectical method to unravel the historical process that brought capitalism into existence, creating a class of workers who were separated from the land, from their tools, and from the products of their labour. An all-pervasive alienation. Skipping carefully through the accretion of 150 years of partial and false interpretations, Sayers guides us in welcoming friends and warns of those who would trip us up in understanding what Marx got from Hegel, what he actually said, what he came to understand about the historical trajectory of capitalist production, and what his method allowed him to see in the future concerning its replacement. Or, as one of the banners in the St Paul's tent village occupation proposes, let's “Compost Capitalism”! Five chapters give an account of the existential and Marxist philosophical strands arising from Hegel's concept of alienation. Sayers covers the differing accounts of the changing relationship between the individual and society, the complex, contradictory, dialectical relationship between freedom and the “realm of necessity” and the reduction and eventual overcoming of the distinction between the two. Crucially, there is a detailed examination of Marx's use of the concept of alienation (following Hegel) in his life-long critique of political economy, both its negative sides, but also its positive role in the historical phenomenon of dialectically-developing human nature. This is already a rich source of knowledge in just 100 pages but, in following through into the “negation of the negation”, the expropriation of the expropriators, Sayers takes the story through to its conclusion. He traces Marx's evolving views on the “abolition of bourgeois property” which defines communism with a clear exposition of how the logic of the dialectically developing relationship between individual and social property might develop in post-capitalist society. Sayers corrects misunderstandings about Marx's concepts of equality and justice in a communist society, and considers how such a society will overcome the damage capitalist society has done. We can forgive Sayers' for seeing the superseding of the present capitalist system as a distant prospect. The product of his labour will certainly help those who read it to understand the immanent process and practice of revolutionary change. Unfortunately, because of its limited edition, it’ll cost you £50 to buy so it’ll only be available in university libraries and similar institutions. Such an important book should have wider access and the publishers ought to think about how to achieve this. Or they might find themselves near the top of the list when it comes to expropriating the expropriators!